Bluetooth speakers are compact portable devices that can be wirelessly connected to smartphones, tablets, and computers for taking calls, streaming music, podcasts or any other form of audio files. Considering its popularity, a wide range of options have made their way to the market, where selecting the ideal one can turn out to be a daunting task. To help you choose the best, in this article I’ll be sharing a detailed comparison of two amazing Bluetooth speakers: JBL Charge 2 and JBL Charge 3, focusing on what makes them different from one another and which one proves to outperform the other in terms of design, features, sound, and connectivity. Portability is the key when it comes to the design of Bluetooth speakers. Because at the end of the day, it must be handy enough to be carried out to almost anywhere you want in a seamless way. In addition, the aesthetics of the speaker are important too. The JBL Charge 2- the earlier model from ‘Charge’ series has the classic cylindrical design and measures 8.3 X 3.9 X 6.5 inches with an overall weight of 2.1 pounds. Thanks to its intuitive built; you can either lay the speaker horizontally or make it stand vertically. In a major change, the buttons that are usually seen in the JBL’s line of speakers have been replaced with embedded versions which add to the exquisite style of Charge 2. Though it requires more effort for pressing them, still the feel is sturdy. Younger to Charge 2, the JBL Charge 3 is a lightweight speaker that stretches to 9.1 X 3.4 X 3.5 inches and weighs a mere 1.8 pounds. The structural design is similar to Charge 2, while the play/pause, power, volume control and Bluetooth pairing buttons are positioned on the top. The external passive radiators are an interesting design element that tends to vibrate when bass-heavy music is played. Coming to durability, the speaker is effectively designed with a rubber guard that can withstand pokes and be propped up horizontally or vertically. To meet the evolving demands of users, the engineers of JBL have brought together some good range of features including speakerphone and a unique Social Mode that connects the speaker to three different devices at once. Another noteworthy feature of this model is the 7.5W power output that creates a huge impact on the sound quality. This results in frequency response in even the lower range. In my testing, it is about 80 Hz to 20 KHz and that’s good. The speaker can even be used to charge various portable devices using the USB port present at the back. It is backed by a 6000mAH battery that is able to last for almost 12 hours but on the downside, it takes nearly 4 hours to charge completely. JBL Charge 3, the advance version features certain improvements in the speaker compared to Charge 2. The speakerphone system is taken to the next level with noise and echo-canceling technology that ensures quality calls and reduces distortions. The star of the show is the astounding IPX7 waterproofing that amplifies its moisture-resistance property and allows the speaker to operate in an effortless manner even when its 100% submerged in water. Again, the battery is significantly improved with a lithium-ion polymer that can last over 20 hours of continuous usage. Due to the heavy bass and depth produced by JBL Charge 2, the sound is always crisp and clean. The moment you begin to use it, its heavy bass will make you coming for more. Music genres such as Hip-Hop or Dubstep sound exceptionally well, while the bass songs tried on them performed well too. On the other side, the heavy bass is not a great thing always. In fact, in high volumes, it overshadows the cymbal shorts and completely ruins the listening experience. But, on a brighter note the heavy instruments like bass guitars or drums always standout. Thus, it can be said that music does sound impressive but is not perfectly balanced in JBL Charge 2. JBL Charge 3 stands true to its name with a powerful sound system that is flawlessly highlighted by its dual passive radiators on each side. What I particularly found great is that the sound is substantial and provides better weight to bass kicks and voice. Further, in low sounds, the bass-line goes down offering phenomenal control. 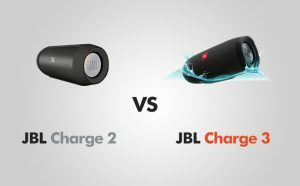 The JBL Charge 2 manages to be expressive but is not able to match the same authority or scale that Charge 3 treasures. The JBL Charge 2 speaker supports pairing with iOS and Android devices. The effective range is about 33 feet without any dropouts. The JBL Charge 3 speaker, as in case of 2 can be easily connected to Android and iOS devices. Though the expected wireless range is not mentioned by the brand, still it maintains good signal within a range of 75 feet. PROS: Exceptionally loud sound / good 12 hours battery life / built-in speakerphone / strong bass / external charger / social sharing mode / powerful Bluetooth playability / automatic re-pairing with previously connected devices / range of 33 feet without dropouts. PROS: Study design / lightweight / superior IPX7 waterproofing / hands-free speakerphone / improved 20 hours battery life / good bass kick responses / charges portable devices / supports JBL Connect / weighty, punchy & solid sound / connects within a range of 75 feet (when no obstructions in-between). CONS: Bulky design/ relatively slow to connect/ no water resistance properties/ too much on the heavy side/ mid-range sounds can be hit or miss. CONS: Highs become muted / exposed woofers / lacks a sense of subtlety and openness. Both JBL Charge 2 and JBL Charge 3 make it tough tiff of premium wireless speakers but if you are in search of an affordable, feature-rich and easy to carry Bluetooth speaker then JBL Charge 3 clearly turns out to be a better option. JBL Charge 2 does boast about its decent sound quality but still struggles to achieve the finesse seen in Charge 3.